Live Creating Yourself. : Seeing Spots. Such a wonderful Thursday night! I got to hang out with Crystal and meet the lovely and oh-so charming Fallon of A Lovely Being, who asked to interview the two of us about Rue. Not only was she beyond professional in her interviewing skills (she asked a lot of great questions and recorded it - as a journalism major, I was tres impressed), but the girl is stylish, sweet, optimistic, passionate, and has great taste in food. She introduced us to a vegetarian/vegan restaurant, Chicago Diner, and let me tell you, the tostadas were woah. Highly recommend going. And I highly recommend you check out her beautiful blog. I will let you all know when the interview goes up. Thanks, again, Fallon! 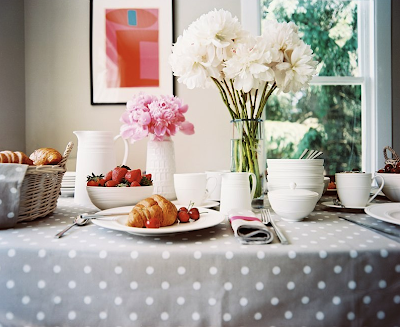 On another note, any idea where I can find a cheaper version of this polka dot table cloth? I kind of need it in my life. Along with that croissant. Ooooh, I do love that tablecloth! I can't believe I overlooked in in Lonny. Happy Friday Alaina! Had a blast with you and Fallon last night. And now I'm seriously wanting a spotted tablecloth myself! Sounds like such a fun night; I can't wait to try the Chicago Diner next time I visit... will keep my eye out for a cute oil cloth alternative--sooo cute! Alaina - I love your apartment! Would you consider doing a couple how-tos on your DIY projects? Like how to reupholster chairs on your own, the steps to repainting wood chairs, etc.? I would love your help, as I'm looking to do some of this stuff to my furniture but I have no idea where to start! Thanks!